A Ballet Memorial For A Son Killed At War Amy Wolfe's son, Colin, was killed in a roadside bomb attack in Iraq in August 2006. Nearly seven years later, Wolfe paid tribute to her son in an unusual way: a ballet. Wolfe, artistic director of Virginia's Manassas Ballet Theatre, talks about the production and shares memories of her son. 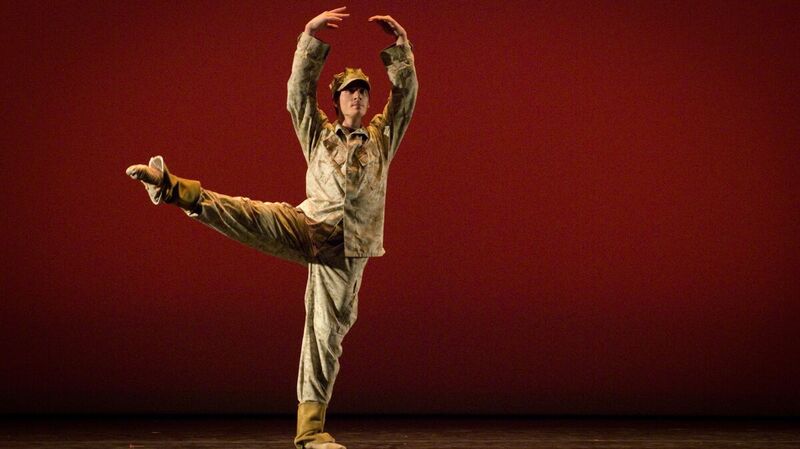 Dancer Josh Burnham plays the role of Colin Wolfe in the Manassas Ballet Theatre production Colin. Colin Wolfe was killed in Iraq in August 2006. A roadside bomb exploded near his vehicle in Anbar province just a few weeks after he arrived. He was one of almost 4,500 U.S. service members killed in Iraq between 2003 and 2012. Nearly seven years later, on the heels of the 10th anniversary of the U.S. invasion of Iraq, his mother paid tribute to her son with a ballet. "You're taking something which is horrible ... and turning it into something which is beautiful and life-affirming," Amy Wolfe tells NPR's Lynn Neary. "That's the way art is." 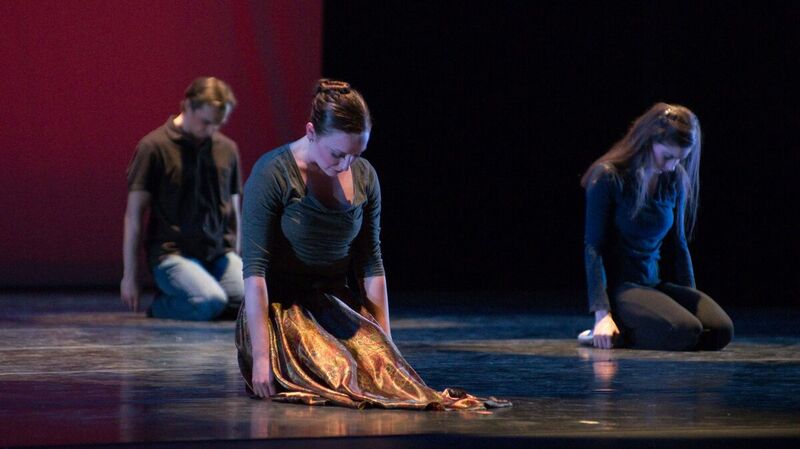 Wolfe, artistic director of the Manassas Ballet Theatre in Virginia, choreographed and cast a four-part performance celebrating the young Marine's life. The ballet, simply called Colin, debuted in early March. Colin, who was 19 at the time of his death, grew up dancing in the ballet company that his parents owned. Wolfe says he wanted to be a Marine ever since Marines came to his elementary school. His interest was solidified after Sept. 11, 2001. "As he got older, he realized ballet was not his thing," Wolfe says, "but he kept doing it for me." He practiced ballet right up until he enlisted. Wolfe says she never intended to make a ballet about his death. A composer friend expressed interest in writing music for the ballet company, and wanted to compose something with a patriotic theme. "I took it one step further and said, 'Why don't we make it about Colin?' "
Wolfe's husband, Mark, the executive director of the dance company, was skeptical about the idea at first. He was worried about how she would handle the process emotionally. For Amy Wolfe, the experience was an important part of the grieving process. "I actually loved working on it. I kept my emotions at arm's length and looked at it as director and choreographer," she says. "Most of the time, 95 percent of the time, I was able to keep my emotions as mother out of it." The ballet has four movements. The first, called "Home," shows Colin as a little boy playing with his sister, practicing at the ballet bar and saying Sabbath prayers. It ends with Sept. 11 and his decision to become a Marine. That leads into the second movement, "Commitment and His Decision." The third movement, "Love," tells the story of how he met his girlfriend one month before deployment. The final movement, "War," shows him patrolling the streets in Iraq. "And then he exits from the stage, and you know that the roadside bomb is there," Wolfe says. "His mother, me portrayed by a dancer, comes running onto the stage as if to find him in his bedroom. But, of course, he's not there. The fourth movement goes on to show ... how we all coped with our misery." Margaret Hannah danced the role of Colin's mother, Amy Wolfe; Aleksey Kudrin played his brother, Sean; and Sara Gaydash played his sister, Cece. Wolfe cast dancer Joshua Burnham to play Colin. She said he has a similar personality, almost the same build, and is the same age Colin would have been today. "It was a huge experience," she says. "At the conclusion of each performance, he cried for like five minutes." Wolfe says she did have a number of trying emotional moments during the creation of the ballet, but the toughest time came at the end. "For me, then it was Colin's life coming to an end again," says Wolfe. "I had put his whole life on to the stage. So for me, he was living again on stage. And for the whole process to come to an end and be over, indeed it was like his life was over again." Since the performance, Wolfe has received an outpouring of meaningful responses from other military families. "There is a work of art that will go on forever," Wolfe says. "And so in one way, Colin will now live forever."